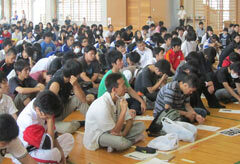 The students listening to Ota at Mawashi High School in Naha on June 4. In the lead up to the 69th anniversary of the Battle of Okinawa, former Okinawa Governor Masahide Ota who is director of the Ota Peace Research Institute, has delivered a lecture at Mawashi High School on June 4. Ota said, "The Abe administration's revising of the Constitution of Japan matters to young people."